Barry Allen's jailed father is in for some trouble. According to The CW's description, on the Feb. 2 episode of The Flash, "when Henry snoops around in an attempt to help Joe and Barry... he ends up in the infirmary after getting roughed up by inmates." 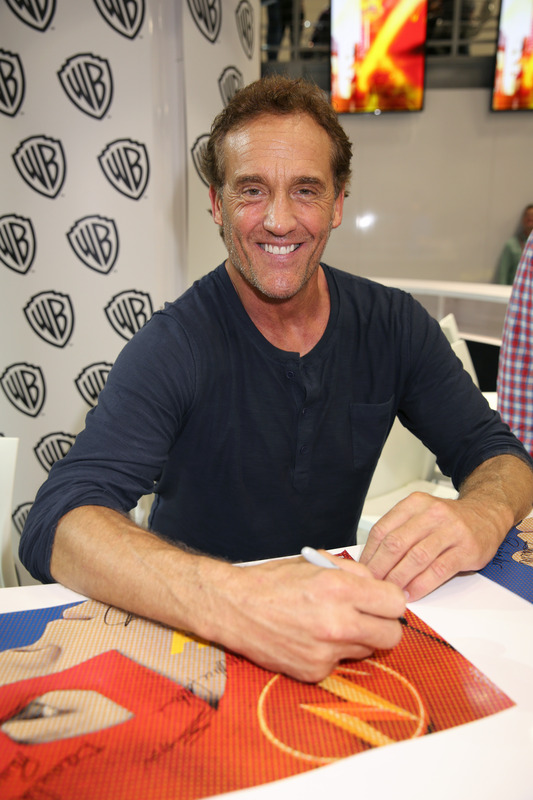 Now that Papa Flash is back in the spotlight, where have we seen actor John Wesley Shipp besides The Flash ? You may already know that Shipp played The Flash in the 1990s television series (the one that Sheldon loves on Big Bang Theory). You may, like me, have formed a conspiracy theory about the fact that Barry's dad was once Barry himself. Add that he also voiced Professor Zoom on an episode of the animated series Batman: The Brave And The Bold , and my brain hurts. Are there even multiple characters on The Flash, or is everyone just a variation of everybody else? Thank goodness that time travel is getting introduced on this show soon, so we can start to clear some of this up. But who am I kidding? I'm sure it will raise as many questions as Harrison Wells has lairs in his laboratory. Anyway, outside of DC Comics, Shipp has a well-received career. He has been on your television screen since the 1980s whether you knew it or not! Here are a few ways you've caught the former Flash over the years. The superhero is a major soap opera veteran. Over the years, Shipp has starred in Once Life To Live, Guiding Light, Santa Barbara, and As The World Turns. He has two Daytime Emmys for his performances. In the clip above, he shares a scene with recent Screen Actor's Guild winner Julianne Moore! Next, Shipp is probably best known for playing Dawson's dad on Dawson's Creek. Above is a collection of some of his earlier moments. Hey, at least Henry Allen can't embarrass his son like this from behind bars, right? You can also find him in a few episodes of Teen Wolf, Drop Dead Diva, and The Closer. '90s kids will recognize Barry Allen's sad as Barney Bux, the dad from The Neverending Story II: The Next Chapter. I'm noticing a theme here, are you? He also has upcoming roles in two apocalyptic science fiction features, and you can catch him in a slew of Lifetime Movies. Don't think I won't be using that bit of knowledge to try to get my mother to watch The Flash, because I will. His credits in television movies include Christie's Revenge, Road Rage, Second To Die, and Deadly Web — remember how scared we were of the internet back in the 1990s? If only we knew. This sounds backwards, but it's easy to see why Grant Gustin was cast as Shipp's son. The two actors have a similar kind of charm, and that's one of the things that makes The Flash so enjoyable!